List segmentation is a very powerful feature of Aweber but most bloggers don’t take advantage of it. If you are pushing your new email signups through any kind of auto responder sales funnel, then segmenting a list is something I recommend highly. Segmenting a list means breaking it down into little pieces. Instead of emailing the entire list, you only email a segment of it. Lists can be segmented in many ways. For example, you can segment a list into US or Canada only subscribers if those are the people you want to target. 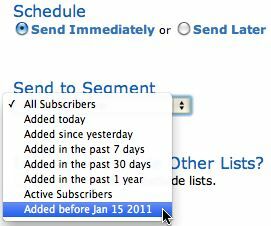 For a blogger with an auto responder sales funnel, the most useful segment feature is the date added. When you’re pushing new signups through the funnel, you don’t want to send them anything else. The problem happens when you’re doing a promotion and want to email your list about it. Chances are, the people who just signed up are not going to respond well to a promotional email from you. They just signed up and may have just received your welcome email. Now you’re trying to sell them something before you’ve establish a relationship with them. Your auto responder funnel is meant to build your relationship with the reader and establish trust. You want to let the reader go through it (or a good ways through it) before sending them any outside promotions. Here’s how to segment your list so people going through the funnel doesn’t get any other emails. let’s assume that your auto responder sequence is one month long and you don’t want people in the funnel getting any other emails. What you would do is use the Aweber Segment feature to find all the subscriber who signed up to your list 30 days or longer ago. The list generated would only contain subscribers that have been through the sales funnel. Depending on how big your list is, the search can take anywhere from a second to a few minutes to generate. Give the new segmented list a name and save it. 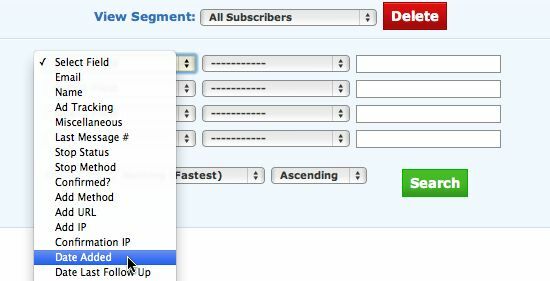 Now that you’ve created a segmented list containing only subscriber who have been through your sales funnel, you just email the segmented list instead of your full list. In Aweber, choose “Broadcast” from the “Message” tab and create a new broadcast message. Write your email like normal. Directly below your Schedule option will be a drop down menu call Send to Segment. Clicking the menu will bring up the segments available. Select the segment you created and save the message. Now you’re ready to email your promotional offer to all the 30+ day old subscribers while your auto responder funnel continues to build that relationship with your new subscribers. If your blog doesn’t have an email list, you are leaving a ton of money on the table. My mailing list is the number one reason my blog makes income that it does. Aweber is the best email service I have ever used. Their feature set is beyond anything else in the industry and the list segmentation tool is another reason they’re the best.